With Nebraska’s knack for growing things, it’s no surprise that you can find some of the tastiest farm-fresh produce here. Nebraska’s lush soil cultivates a variety of delicious produce including apples, berries, grapes, asparagus, squash, melons, sweet corn, peaches, potatoes, cherries, and more. The middle-aged felon in the nice dark suit was just sentenced to prison and court was now adjourned in Plattsmouth, Nebraska. Ordinarily, high-profile felons being carted off to prison know the drill. You stand still. Put your hands at your side. The courthouse sheriff’s deputy rushes in and firmly slaps the steel handcuffs on your wrists and escorts you, arm in arm, back to the jail. That afternoon, Nebraska’s photojournalists and television trucks were ready. The news media camped out inside the Cass County Courthouse in Plattsmouth. Their quest was to capture a gripping image of Dave Kofoed, the evidence-planting Douglas County Sheriff’s Office CSI chief, as he was supposed to be hauled away in handcuffs. But that was never going to happen. Although Kofoed was just sentenced to prison, a uniformed Cass County Sheriff’s guard casually approached Kofoed and just let the new prisoner strut out of the courtroom without any handcuffs, before hopping on a courthouse elevator together. The folks at the Cass County Sheriff’s Office afforded the villain Kofoed special treatment. They went to bat for their old law enforcement friend even though he had disgraced the entire Nebraska law enforcement profession. The flurry in the letters columns of the local press that accompanied the publication last September of Rachel Pokora’s Crisis of Catholic Authority was a kind of belated echo of the media turbulence inspired in the spring of 1996 by the event whose history Professor Pokora recounts in her book: Bishop Fabian Bruskewitz’s decision to excommunicate Diocese of Lincoln Catholics who belonged to the state chapter of the group Call to Action. I doubt the world will ever be rid of guns, warships, warplanes, or missiles, whether they be guided or helter-skelter, but it is a peaceful idea to consider this early September, peaceful morning in Polk, with a bit of ground fog, calm air, and a rising sun quietly shining on the foggy ground. About fifty thousand years ago, as the northern hemisphere was locked in a global deep-freeze and the continental glaciers of the Pleistocene were at a maximum, a large land bridge that connected Asia and North America existed in the general region now occupied by the Bering Sea and Alaska, the so-called “Beringia” region. Across that corridor many mammals migrated from Asia over the millennia, including North America’s ancestral brown bears and, much more recently, the first humans. One early influx of bears arrived in North America from Asia less than fifty thousand years ago. Some of these ancestral Alaskan brown bears apparently became isolated in island and coastal habitats by the last of the great glaciers, and the polar bear evolved from them. 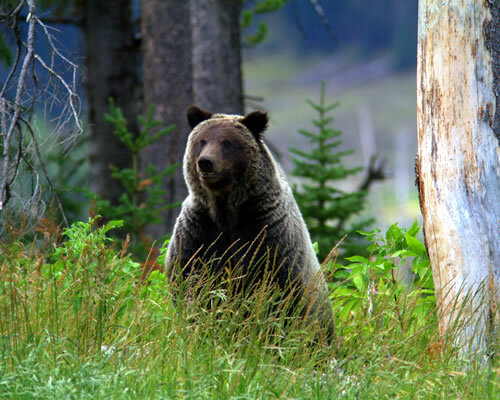 A later influx of bears from Asia produced the modern brown and grizzly bears (Ursus arctos). It’s August of 2013, and I’m standing on a hillside in northwest Lancaster County, gazing into the distance through morning haze and waiting to hear that distinctive chopping sound made by large helicopters. In front of me a few feet downhill is something that looks like a gigantic Hula-Hoop with a metal box attached to one side of its curve. The helicopter and the hoop represent a sea change in the way geohydrologists will go about the work of finding and defining aquifers. This technology won’t make drilling test holes obsolete. There will always be a need for human beings and drill rigs to establish the “ground truth” for what lies underneath a specific point on earth’s surface. But the equipment in that metal box does represent a revolution in how geologists will put together the descriptions and cross sections of the earth’s crust in a level of detail not previously possible. With ever-increasing certainty, geologists will be able to map the positions and compositions of previously “unseeable” layers of rock. Nebraska is about agriculture. We have almost forty-seven thousand farms and ranches that produce food for Americans and the world. Our state is first in beef cattle, red meat production, great northern beans, popcorn, and irrigated acres, second in ethanol, third in corn, fifth in soybeans, sixth in pork. Cash receipts from Nebraska farm marketing contributed over $24 million to Nebraska’s economy in 2012. Over 95 percent of our farms are family-owned, and these farm families foster strong rural communities that grow strong kids. In these times of deep political division, a sense of community is often lost in a cacophony of special interests, individual pursuits, and various grievances both real and imagined. Nebraska Nexus—a seventy-five-minute video that recently aired on Nebraska Educational Television—cuts through the noise, asking us to come together in conversations about our future and reviving that sense of community that has long been the pride of rural and urban settlements across the North American prairies. A farmer’s work ethic gets tested between drought and floods. Drought in 2002 and cattle markets closing in 2003 took everything Ward Hoculak had on his Lamont, Alberta farm. It was “start over” for the fourth-generation, forty-three-year-old farmer. The world closed its borders to Canadian beef because of bovine spongiform encephalopathy, also known as mad cow disease, devastating all cattle farmers, Ward said. He was tired of spraying chemicals, and he and his brother Sid complained about low commodity prices. He said it made him sick to work year-round and never see a penny, with most of his money feeding chemical and fertilizer companies. Many are surprised to hear me speak of the deep beauty to be found in the oak-aspen woodlands of urban Winnipeg. By design and by accident, natural areas big and small have survived both in-fill development and urban sprawl. I love the seven-hundred-acre Assiniboine Forest; people go about their fossil-fueled lives while nature minds her mysterious business right around the corner. But my favorite urban nature preserve is the much smaller Living Prairie Museum, just down the street from the international airport. Bound by commercial properties and flanked by an asphalt bike route, LPM preserves remnant prairie, native woodland, and a measure of wildness. As Doug Sieck gazes across his three-thousand-acre farm and ranch operation, his focus isn’t so much on the surface of the land as it is on what’s beneath the surface. That wasn’t always his inclination. For nearly forty years I have been a Nebraskan by choice. I love this state and have served Nebraska every way I am able, as writer, educator, and citizen. My own ancestors settled in the Deep South, dating back to early Colonial times. I spent much of my youth in Georgia and Louisiana, where my closest relatives still live. My family was active in Atlanta’s civil rights movement—I have written elsewhere of my meeting with Coretta Scott King on the night of Dr. King’s assassination.